I read an funny article in local paper the other day that said, “The Way You Eat Your Oreo Says Something About You.” According to a survey of over 2000 Oreo lovers, psychologists, and food writers apparently there are three types of Oreo lovers. Dunkers tend to be energetic, adventurous, and extremely social. 87% of dunkers say milk is their liquid of choice for dunking. Twisters — tend to be emotional, sensitive, artistic, and trendy. Biters are easy going, self-confident, and optimistic. The survey also discovered that more women tend to be dunkers while men tend to be biters. And, Democrats tend to twist, Republicans tend to dunk! And What about me ?? (I tend to be in first two types) – Twist Oreo apart, eat the side without the icing and drink milk. Then I lick off the icing and drink more milk, and then I eat the last part and finish my cup of milk. I personally think it makes the Oreo last longer ‘cause you get two cookies. So How Do You Eat Your Oreos? Twist Apart? Dunk in Milk? or Bite Right In? I would like to hear from you, don’t hesitate to comment. 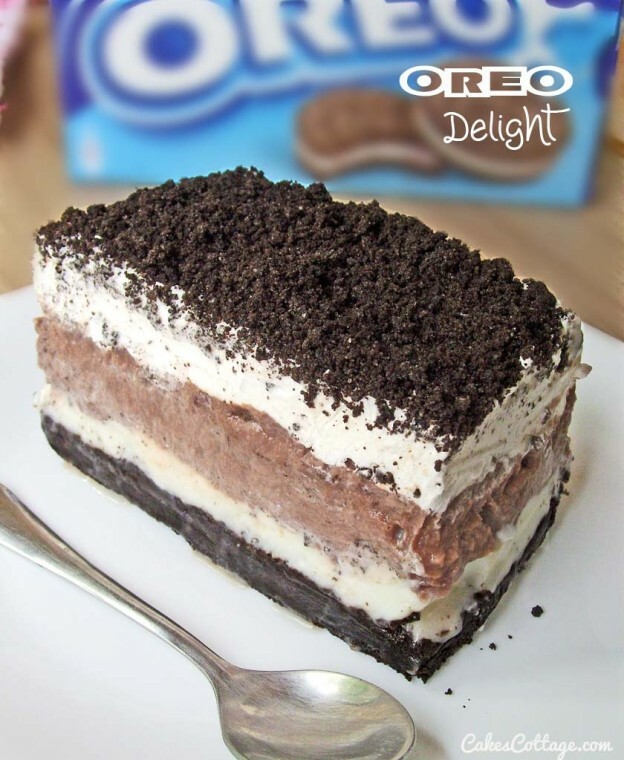 OK, Let’s Get Back to the today recipe, Can i suggest you yet another delicious way to Eat Your Oreo,….Or should I say HEAVEN!? This is one of those desserts you can eat half the pan before you even realize it, so watch out. Crush the whole package of cookies either with a food processor, or take out your frustrations and do with a rolling pin. Save about 1 cup to sprinkle on top of dessert when it's done. In a small bowl mix remaining crumbs with melted butter. Press Oreo crumbs/butter mixture into bottom of 9X13 pan to form a crust. Spread the Cool Whip/cream cheese/sugar mixture on top of the oreo crust. Spread the pudding over the previous layer, then your remaining half of cool whip on top. Sprinkle with reserved Oreo crumbs on top. 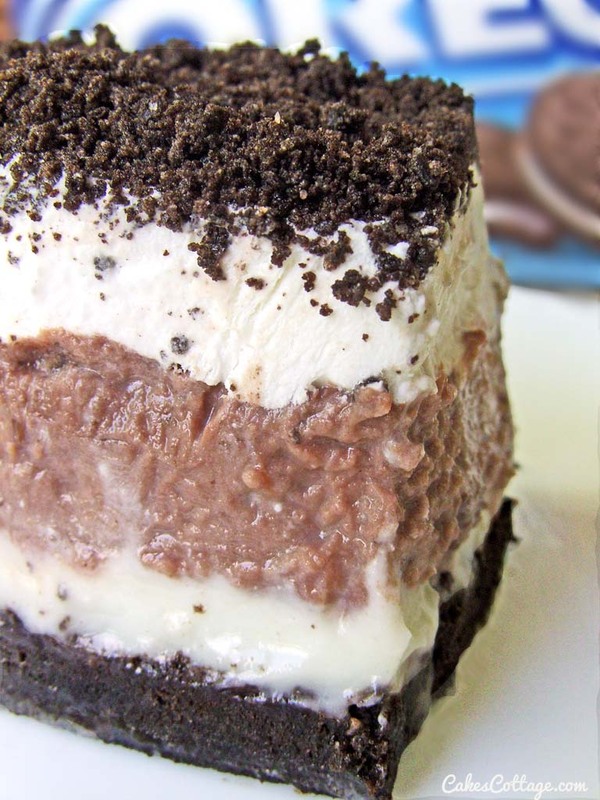 This entry was posted in Cakes and tagged Chocolate Pudding, cream cheese, Oreo on June 4, 2014 by Dan. This sounds so good, especially being a chocoholic. I make something similar to yours. Instead of oreo crust I make a brownie on the bottom, the other 3 layers are the same except I put chocolate shavings on top. Will certainly try your version. Thank You! What size of pan is this to be made in? Let me know how that turned out. Can’t wait to try this, Oreo’s have always been a staple on my grocery list. I am going to make this with gluten free cookies ( oreo like), thank you for this recipe! Where does the 2 3/4 cup milk come in? 2 3/4 cup of milk is used for making the pudding. I’m sorry for the late response and I hope your cake turned out well ! can you use whipped cream and use that instead of cool whip and cream cheese ? Should you use instant pudding or regular pudding? Where do I find a 69 ounce box of chocolate pudding? Recipe calls for 1 large (5.9-ounce) pkg chocolate instant pudding. 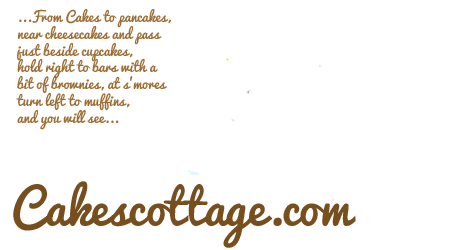 Perhaps these “country looking style” fonts are sometimes little bit difficult for read, so sorry about that. Lastly, It’s sooo easy and yummy and I hope you enjoy it! Can you make this a day ahead of the day you are serving it? SURE !!! It’s best if it chills at least 3 hours, but I think it’s better overnight or next day !! Please remember to keep chilled and serve chilled, otherwise it will just melt apart. Are you supposed to remove the filling from the oreo? No, there is no need to remove the cream, you can crush it all together. It works really well to crush them in a food processor too. I’m making this tonight for an event tomorrow. One way I made it quicker is after I crushed the Oreos in the food processor, I removed the cup of cookies for,the top. Then I just added the melted butter to the remaining cookies crumbs in the food processor & gave it a few pulses to blend. One less bowl to clean up! Also, I don’t think half of a regular size cool whip is enough for,the top layer. It didn’t cover the whole top. So, I’m going to buy another cool whip & spread another half on top. Next time, I will buy the bigger size cool,whip & only use the equivalent of half a regular size for,the cheesecake layer … Maybe about a third. Then there should be enough cool,whip to make,the top nice & full. It looks so yummy! Can’t wait to serve it to my friends tomorrow. After I retread the recipe, I see it calls for 16 oz cool whip not 8. My mistake. Even with my mistake, I think it will still be very yummy! Hmm-never thought of an Oreo being particularly political before – but I am a twister and surprisingly enough I AM a Democrat! LOL! Dessert looks good – definitely going to make one soon! Will make this for my granddaughter’s birthday this weekend! It sounds sooo good! I just made this. I had a hard time spreading the cream cheese mixture over the crust. There wasn’t enough to fill the pan and the crust kept coming up. I hope it taste better than it looks. Sounds mouthwatering! Can anyone please tell me if I can freeze this dessert ahead of time? I am going to make it tonight for a party. Quick response needed please.. I love chocolate and oreo so are my favorite cookies. Pd: I have a cooking blog in Spanish with Google translation in many languages. We are serious about our Oreos so I buy a large box at Costco with sleeves of Oreos in it. 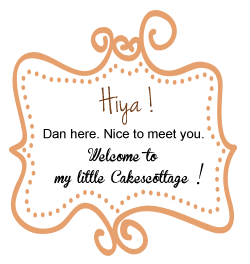 How many cookies or sleeves should I use to equal a regular package? i have only just seen this recipe on Facebook, but my problem is that i have no idea exactly how much is a pkg of oreos, since i live abroad and there are a couple of sizes available so could you please give me a weight instead , thank you.